Regular Cartoon Network viewers and anime fans will probably already be familiar with the Cowboy Bebop TV series. For those in the dark: it is a 1998 Japanese animated TV series about a disparate group of intergalactic bounty hunters. In this full-length movie version, they become embroiled in a plot involving bioterrorism while tracking down a minor criminal. The title not only refers to the name of their spaceship to my mind, but is also indicative of the show’s style. After all, one wouldn’t usually associate bebop (a type of jazz played after WWII by the likes of Charlie Parker and Dizzy Gillespie) with the term “cowboy”. Thus, the show is an eclectic mix of different styles. Imagine traditional anime character designs set against a Heavy Metal or 2000 A.D. (for our Brit readers out there) magazine backdrop with circa a 1960s Blue Note record label jazz soundtrack. Throw in other visual and plot elements such as 1970s TV shows, homages to classic SF movies such as 2001 and Alien, and you still wouldn’t have an idea of what to expect. It all gels together though. While it may sound like an over-stylized mess and a case of style over substance, Cowboy Bebop is at times surprisingly emotionally affecting and sunny. (It isn’t nowhere as violent or dystopic as Akira and Ghost in the Shell for instance.) The 23 minute or so long shows are hugely entertaining – with the only criticism being that it at times didn’t live up to the high standards it set itself. Oh, and that in order to cramp in events in its short running time that narrative and logic takes a backseat. This full-length movie alas suffers from both I’m afraid: many of the episodes are better and while the running time here is longer, the narrative is still a bit of mess. In addition, some bits of the movie still feel like padding. That doesn’t make it bad though: the animation is excellent, the soundtrack adequate (I still missed the show’s regular signature tune though – catchy stuff indeed!) and some action set pieces simply jaw-droppingly well done. Regular fans will however be slightly let down and newbies will be nonplussed as to the show’s dedicated cult following. Note the slightly: Cowboy Bebop remains quite watchable and much better than a lot of the stuff out there. 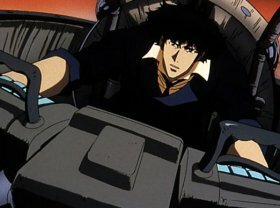 While the movie stands on its own and it isn’t necessary for newcomers to have seen any of the TV show episodes, it isn’t necessarily the best introduction to Cowboy Bebop. Rather check out the first few TV episodes on DVD instead.